Gas Springs assist when lifting, lowering, opening, and closing ​heavy lids. They aid in lifting the hood and trunk lid (boot / back doors) of passenger and commercial vehicles in the automotive industry. 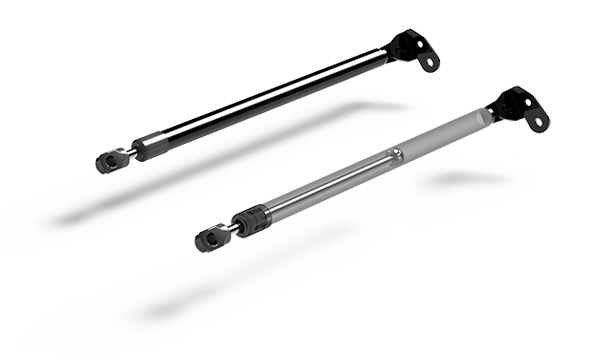 TRAC Ultra Lift gas springs are available as standard gas springs as well as with ​groove​. TRAC Ultra Lift gas springs are manufactured accurately out of environmentally friendly materials by using technologically advanced manufacturing processes. Consistent quality is guaranteed by diligent monitoring of raw materials, aggressive testing and quality control throughout the production process. The extension force of the gas spring can be controlled depending on your requirement, ensuring user-friendly movement. Our development engineers will assist you in designing the right gas spring to meet your requirement. by covering the complete process chain from design through prototypes and validation to the production of gas springs.